the Secret Weapon of quilters, sewers and embroiderers! wayward stitches we just grab our Go-Go Gadget Seam Ripper! You see, this is not just ANY seam ripper. ergonomic handle and an LED light. Now if only it would feed us chocolate while we sew! This gadget is the perfect stocking stuffer! Especially retailing at only $9.99!! WOW! What an amazing tool! I would love to find one under the tree on Christmas morning, because I would be the envy of all my stitching friends! Not likely though, I have never seen these in Australian quilting/fabric stores! Woah I would love to find that in my stocking ad it is like the Swiss Army knife of seam rippers. It’s totally awesome. This tool would make it so much easier for me to see those “oops” that happen. Since I am someone who makes frequent “oops”, this tool would be so wonderful to have! This looks like just the thing for me and my over 40 eyes! This would be great for my tired old eyes! Thanks! Oh the whoas of unsewing! This little baby could certainly help! A light and a magnifying glass. This could be quite useful! Sounds like the perfect gift for the “mature” quilter or sewer. I want Santa to leave this in my stocking because Oh My does my machine ever make mistakes. I think sometimes it just gets mad at me for being gone all day. This little gem would certainly help to clean up the messes it makes when it is angry with me. Holy Light Bulb!!! This little Quilters Gadget gives a whole new meaning to “RipIt RipIt RipIt”. I’d be tempted to ‘Stitch a Crooked Seam’ just to ‘UseIt UseIt UseIt’. Great GiveAway…thanks for the opportunity! What a nifty gadget. I have them all over my sewing room. Which, of course, I never use! Lol. Please, Santa! This gizmo would change my life!! Wow, this nifty little gadget may just solve all my problems! Santa, Please leave this in my stocking. I need the extra light and I’m sure the elves have told you how much unsewing I do. Dear Santa, I really could use this! Sometimes my eyes need a little help. Thank you for the giveaway. What a great idea! I’ve never seen one before! Perfect for my poor old eyes!! Would love to try this tool. My current seam ripper??? It’s the one I bought (make that my parents bought) for me for my 7 th grade Home Ec class! And believe me……it has seen LOTS of use! Thanks for the chance to win. Oh, forgot to mention……7th grade was 1977.
the old eyes aren’t what they used to be, so the magnifyer sounds like a blessing to be sure you know, for when that machine is naughty and makes a boo boo. This is so unique. 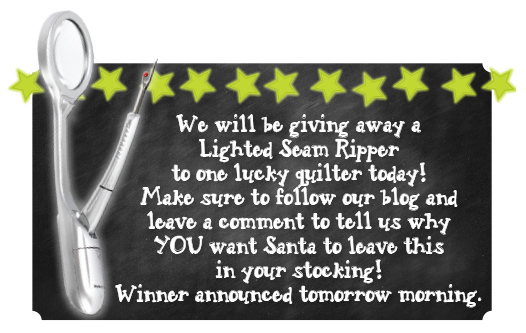 I would love to see this amazing lighted seam ripper in my stocking. This would be another tool to add to my box cutter. Can’t wait to have it and start ripping out seams. Thank you for such a valuable gift. I would love this! I could undo all my frantic sewing (done in my basement sewing room) in the family room, surrounded by family, despite the poor lighting! Any tool that can help me see better what I am doing is a friend of mine! This looks amazing and I would love this too! I would love for Santa to leave this amplified-vision seam ripper in my stocking because I sometimes poke holes in my fabric when I have to rip a sewn seam. I know that you will remember my red and white project. I threw it in the UFO cabinet when I realized I had sewn the wrong fabric to the Bazillion half square triangles. Please, Santa, bring me a lighted seam ripper. I NEED one! Wow! This might make frogging kind of fun – thanks for a chance to win! Yes, my machine sews mistakes sometimes too. I would be thrilled to find the lighted seam ripper in my stocking. I already follow your blog. I could really use this lighted seam ripper because I am the Queen of Ripping. I am too much of a perfectionist & am always ripping out, so this would be a perfect tool for me. I am a devout follower of the Moda Cutting Table Blog ! Love it! This seam ripper would really be nice for those times when I’ve quilted into the wee hours and my eyes go fuzzy. Thanks for the chance! Santa knows that it is getting harder and harder for me to see when I’m sewing yet alone ripping, so he knows I need this tool. That would be a welcome and often use addition to my stocking. Because I refuse to admit that I need magnifying glasses to see small things, this ripper would be a legit way to better see the stitches and not have to wear glasses. My blog name is ‘Where is my Seam Ripper?’. Need I say more? WOW! That’s awesome! I would love it because it seems there just ever isn’t enough light! Sure could find a use for this, especially when sewing (and unsewing) at night! I need santa to leave me this! I’m blind as a bat and this would make ripping out seams so much faster if i could see them. Santa please put this in my stocking! I can never find my reading glasses! A fantastic tool that should be in my stocking because I mess up my sewing a lot and it’s unique features would be a real help for my eyes. I need one of these in my stocking because my old eyes need all the help they can get. SANTA,I NEED YOU TO LEAVE THIS NEAT LITTLE TOOL IN MY STOCKING! I think this is so handy- I could totally see my Grandmother using it and I would love to be able to give it to her. Oh yeah…I would be THRILLED to find this little tool in my stocking!! Thanks for the chance to win it! Santa, try as I do, I still make some boo-boos when I am sewing. 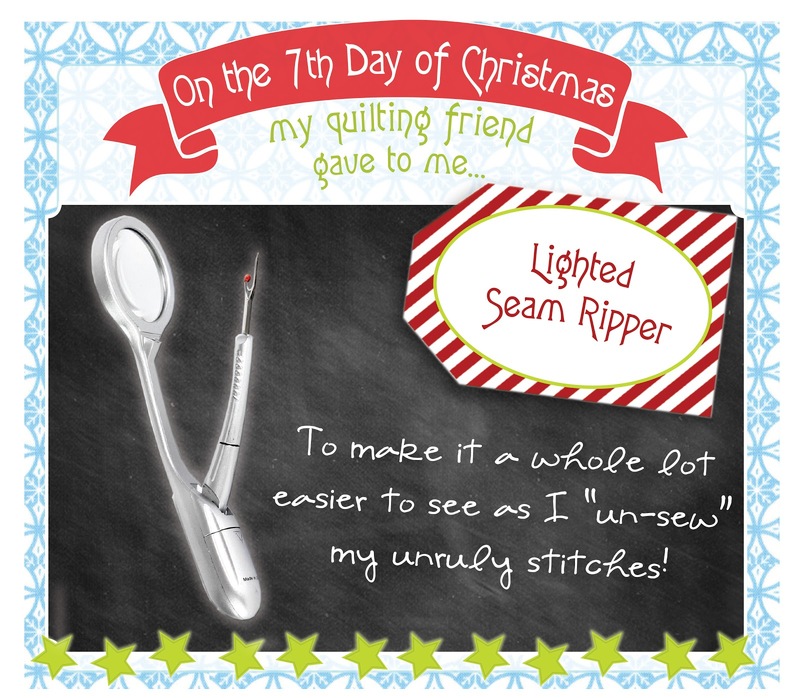 I could really use this unsewer, the “Lighted Seam Ripper” in my Christmas stocking. Besides, as the years creep up on me, I find I need extra light and a bit of magnification. I am as blind as a bat when it comes to un-sewing! LOL, and my glasses or readers are never close by. This seam ripper would take away the stress of picking out stitches. Santa, please bring me one for Christmas!!!! These gramma’s eyes are not what they use to be. They need a little help now and then. I’m not a perfect sewer either! Oh well, I try! 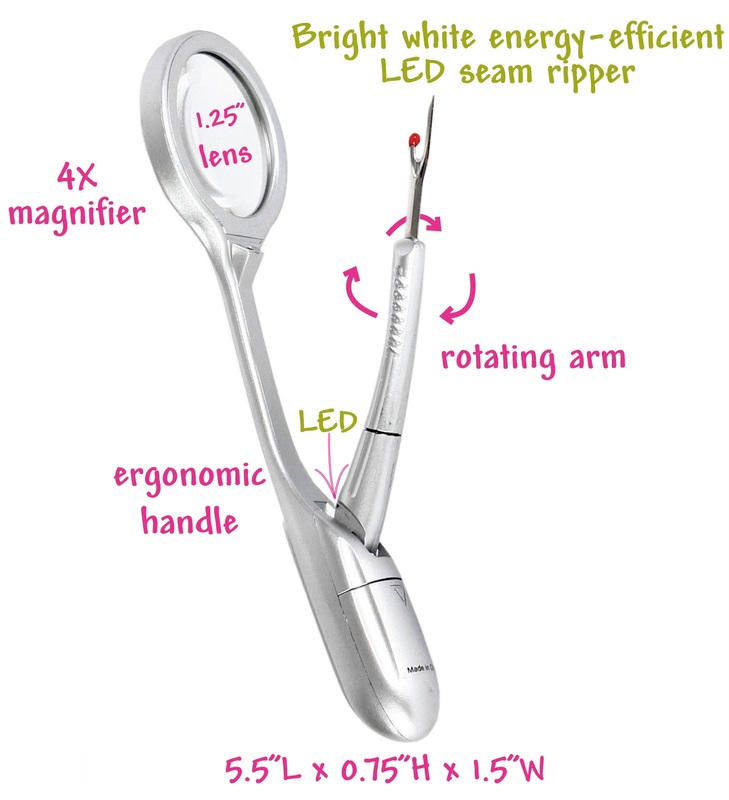 A lighted, magnified, ergonomic seam ripper with a rotating arm? I gave up on those cheap seam rippers years ago but this modern seam ripper just might be the push for me to give up my straight-edged blade, especially since my eyesight to tedious sewing jobs is not as good as it used to be! Happy Holidays. I could sure use a new seam ripper. I have been using my current one for over 20 years! I would love it in my stocking mainly because I don’t have it!!! !I have a hard time seeing and this would help my rippingdsr skills immeasurably. I have been trying to get hold of one of those for a long time but no quilting store I have visited this past years has carried these. Thank you for the opportunity to win one instead. Sometimes I make mistakes, so lighting the way would make it easier to fix. I need one to help me see my mistakes! Thanks. After having to remove black thread from black fabric, this is definitely on my list of I NEED THIS! Now that I have middle-aged eyes, I soooooo need this in my stocking!! I’m a follower! As my eyes age (my, eyes, not me…!) I can use all of the help I can get. Light and magnification should do the trick! Many thanks! I suffer from double vision, so this would be a huge help! My husband would agree I need this handy dandy tool! My stocking is empty so far, I am hoping this finds it way into my poor, empty stocking. With this seam ripper, I can see the light … and my mistakes! I would love to find this in my Christmas stocking instead of reading glasses which I can never find when I need them. When I am stitching away and need to use the seam ripper more often than I like to admit, I would not have to hunt for my glasses. What a really cool idea! 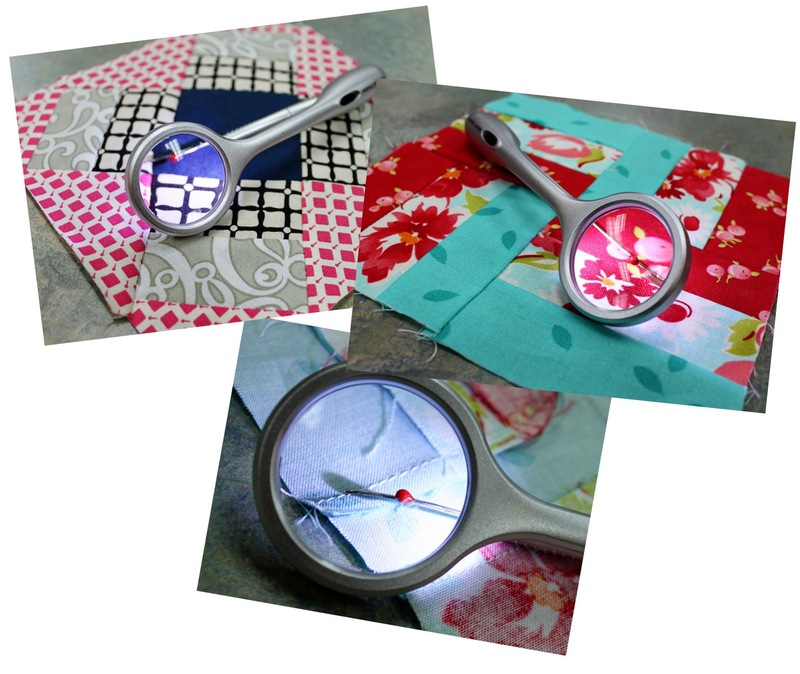 As many times as my sewing machine has messed up I could really use this, the light AND magnifying glass! Please Santa! If not than this is going on my wish list. Now this looks like something that could come in handy for my old eyes. My 53 year old eyes would sure benefit from this handy dandy seam ripper. I don’t wear prescription glasses but have recently taken to wearing some off-the-shelf reading glasses when I sew. What a difference they make. This would be PERFECT for me! This is fabulous – hope I am lucky. A tool that can help my failing eyesight? What more could I ask for? A tool that magnifies what you need to unsew! Perfect for me as I unsew frequently and I need to know where my hand is taking that ripper. Thank you for this great giveaway. Well you see Santa, as I’m getting old and my glasses don’t always cut it, this lighted seam ripper would be quite helpful. Santa even though I can see fine closeup I would luv to add this to my tool kit. You know how much I need this! Santa is a kind man, he feels sorry for me when I have to rip stitches out of my quilt top. He worries about my eyesight and thinks this tool is awesome! I think he is a kind and very smart man! A lighted seam ripper would be very handy when I have to undo my mistakes (which happen way to often!). Thanks for the giveaway and the chance to find out about some really great products! That is a must have tool. I broke the tip off my favorite seam ripper, plus I can’t see worth a darn anymore. This tool would solve both problems. I love following yor blog and getting the newsletter. this would be so helpful for that technique that I use all to often; reverse sewing.Thank you for the contest. Hhmmmm, just went to the eye doctor yesterday and found out my eyes are wprse then I thought….which is not good. Really could use this! i think i unpick more seams than i sew … argh! it only seems like i do. the lighted, magnified ripper would certainly change my attitude! thanx for the chance to win one. Dear Santa, I would love to have this great tool, you see, these over 60 eyes could really use the help when trying to follow those little mistakes. Wow, what a great gift, especially to those of us that are visually challenged…. Looks like just the kind of help I need! I would love to have this for my stocking as the light and magnifier would really help when try to remove those wayward stitches. This would be a great help for me. I had a double vision problem. This is great, I did not know it even existed! Since I’ve gotten older, the more light the better! Oh my goodness…my eyes are jumping with excitement…they see an end in sight for “squinting”! LOL All kidding aside, this little tool would be a given from heaven!! Whatever will they come up with next??? Wow Santa, I sure could use this! My eyesight isn’t what it used to be and this would sure help ! Santa, as you know I really need lots of light to remove those inaccurate seam allowances. And I promise to be good and share at bees. All I can say is Santa,,,I have been good, but I’m sure not winning anything lately. Any quilter with “over 50” eyes would love to have this! What a ripper. Built in light and magnifier – perfect. Just what I need. Because I have to rip out A LOT! I would love to get one of these in my stocking! I would hope that with 100,000 hours of light, I would never use it up! My poor eyesight could really use this seam ripper. Thanks for the chance to win it. This would be great for eyes to see better with and a great Christmas gift. What a fabulous little tool. Especially as I need magnifiers now to see anything up close! Damn the aging process! i’m about to turn 45 and am noticing my vision is blurring up close! plus my seam ripper is my favorite tool (and most used). thanks!! Well, of coarse it’s the machine that makes the mistakes! This looks like a very cool tool! Wow, this would be one handy little dude to have around! I can’t see worth a darn up close anymore! Oh Santa please help my poor eyes for Xmas so I can rip out those pesky stitches without any trouble. Oh, so shall we sew, so shall we rip! Santa, please leave this in my stocking because we DO have to rip from time to time! This would make that task so much easier!! This would help tremendously when frogging (rip it, rip it) black thread on black fabric. What a neat idea and so practical – a beautiful sight for sore eyes! Now that’s a sight for sore eyes!! Since unsewing is a specialty of mine, this would be the perfect stocking stuffer. Would love to find this tool in my stocking. These eyes are getting tired and old and unfortunately I still have those “oops” moments. oh man oh man do I need this. Please Santa….I have been very good this year. This would be wonderful in my stocking! My poor old eyes and bifocals are not very good! Thanks for the chance of winning this wonderful gift. What a great thing to find in my stocking! These old eyes aren’t what they used to be. Thanks for the chance to win. I have got to get one!!! my eyes don’t work as well as they used to what a life saver. Perfect gift for these tired eyes! It would be great to rip thread not fabric! I have a very hard time seeing anything small like stitches and it is getting worse. I would love Santa to leave me one of these so I don’t have to take my glasses off all the time to see! I’m definitely at that age where this great tool would come in very handy! Thanks for the chance to win one! Wow that is the Mercedes of seam rippers! Being a woman who is just starting to have to wear “cheater” glasses, it would be great to have both magnification and light. unfortunately I really really need this tool. I probably should just buy me one and put it in my own stocking. Would be really cool to win it though. Thanks. My old eyes just aren’t what they used to be, so I need this tool to help me “unsew”! My beautilful old eyes would love this terrific tool. Holy smokes this would be a miracle tool for me!! I think there was more than once when I wished I had better lighting and better vision for ripping stitches!! A great excuse to make mistakes…this is a great gadget! Sorry to have to say this would get a lot of use at my house. Lots of mistakes and I need as much light as I can get to work on things. Thanks. I didn’t know such a tool existed…but now I do and I think it’s wonderful! Oh! What a great seam ripper! I’d love to find one in my Christmas stocking, what a boon for tired eyes. I usually rip seams at night while I watch tv with my hubby and it is always hard to see. I would love to get one of these in my stocking to try out! Dear Santa, As you know today is my 54th birthday and my eyes have really gotten bad. This awesome seam ripper would help me so much. At my age, the ripper with magnifier would be very beneficial but add a light, too! Wow! I have one of those and it is pretty tricky. It would make a nice stocking stuffer. I do plenty of ripping out, and would give this tool lots of use! I just had a search of the whole sewing room to locate a seam ripper! I promise I’ll take good care of this one, Santa! This gift would be awesome! Please, Santa? My poor old eyes could really use this! I seem to have quite a collection of seam rippers! A lighted one would surely help. Oh the unpicking I could do with a light! Thanks for the opportunity! Oh, my eyes definitely need this little goodie. After just having ripped out the squares for an entire table topper (changed my mind), I surely could have used this. Hope it’s not too late to enter! i have terrible eyesight, so this seam ripper would be wonderful for me!